This Week in Co-Op, Tally and Nick take you on an epic journey into the Torchlight 2 beta and their live streaming of the event from last week. My feelings about Torchlight 1 were similar to how I imagine most of you felt. It was a damn good game, and according to Steam I put about 13 hours into it. The artstyle was great, I loved the pet system, and it just felt like a high quality dungeon crawler. The reason I only put 13 hours into it, and not 130, was because it was a single-player game. Enter Torchlight II: the improved Torchlight, now with co-op! We’ve been kicking around stories about this game for a long time, and it’s had its share of delays (heck, I think Nick has gone hands-on with it several times at all different sorts of conventions). Throughout it all I’ve been thinking in the back of my mind: yeah, Torchlight II - I’ll grab that when it comes out. It was a persistent dot on my future video game radar, always there yet no brighter than the other dots. Yet about a month ago when it finally became clear that it would release sometime relatively soon(ish), I began to check out more videos for it and read some dev diaries. I started to get excited. And then Nick got his hands on beta keys for several of us staff members. Needless to say, I was pretty excited. After actually getting to play it, I’m now rabidly awaiting the game’s release so I can play it with more of my friends. 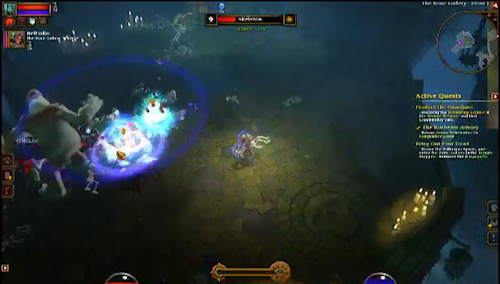 From just comparing the two betas, I’m actually anticipating it more than Diablo 3 (blasphemy, I know). The game that Nick fired up for our TWIC play session was actually the first time I’d gotten to play Torchlight II in its blessed, co-op form. As some of you probably know, Nick was streaming our play session and giving out beta keys for the game via the stream. We started from the very beginning with Nick on an Embermage and me on an Engineer. As we leveled up, I elected to go down the sword-and-board route primarily, with a little bit of heal-bot action. Together, Nick and I mowed down the enemies like butter. I took the vanguard, throwing out repulsion waves and party absorption bubbles while Nick worked his firey death magic from the heavens. Add to this the fact that the public was watching us play (and undoubtable scrutinizing our every move! ), and it was a pretty heady experience. The co-op seemed well supported on all fronts, from the fact that all the loot you can see on the ground is your own personal loot, to the party and group utility skills that every class appears to possess. Needless to say, I’m looking forward to the game’s launch. I hadn’t had much of a chance to dig into the beta yet, only checking out the beserker class for an hour prior. So I was a bit nervous about broadcasting to the world my first attempt at playing an EmberMage. To make matters worse, I had never used TwitchTV to broadcast anything before so I had to deal with the technical hurdles of setting that up. If you watch the stream below you'll notice that the screen is only 1/4 size for almost half of it. Whoops! It wasn't until I fired up a secondary laptop to aid with the stream that I even noticed it. We immediately had a solid 20 people in our room watching the play session and as Tally and I set out across the open world, I started to think about HOW I was playing. Was I letting item descriptions stay on the screen long enough for people to read? Should I query the chat room to ask what skills I should upgrade? Was I being criticized for playing things "wrong?" 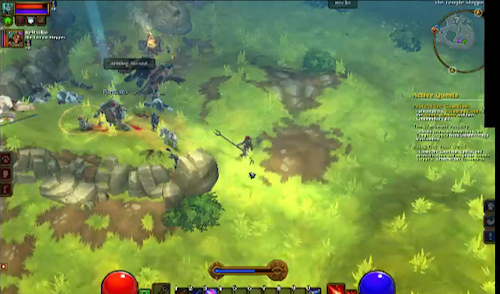 Even with my divided attention between the stream, chat and game, I was being sucked into Torchlight 2 with ease. Tally and I seemed to be tearing through groups of enemies, at times I thought we were simply going to get overwhelmed, but my upgraded fireball spell cut through everything. I couldn’t even SEE what Tally was doing in the chaos, but whatever it was, it was working. We’ll definitely be doing more live stream events like this in the future - we already have one planned with the podcast crew for another game - so it should be quite interesting! Thanks to all those that joined and I hope you got a beta code from us!